Häyhä after being awarded the honorary rifle model 28. 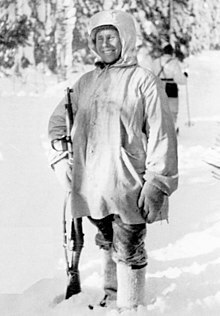 Simo Hayha ( December 17, 1905 – April 1, 2002) was a Finnish soldier. He has the highest recorded number of confirmed sniper kills in any major war. He was so good that the Russian soldiers began to call him as "White Death". He had over 500 confirmed kills during Winter war, which lasted only 105 days. Simo Häyhä spent his last years in Ruokolahti, a small village in southeastern Finland, near the Russian border. He died at the age of 96 in 2002. Actor Steven Wiig portrayed Häyhä in the 2012 HBO docudrama Hemingway & Gellhorn. ↑ 1.0 1.1 Lappalainen, Jukka-Pekka (6 December 2001). "Kollaa kesti, niin myös Simo Häyhä" [The Kollaa held out, so did Simo Häyhä] (fee required). Helsingin Sanomat (in Finnish). Helsinki. Retrieved 19 February 2011. ↑ Rayment, Sean (30 April 2006). "The long view". The Daily Telegraph. London. Retrieved 30 March 2009. This page was last changed on 1 April 2018, at 23:44.